Ask fellow campers about "Big Creek 10 Water Park" and nearby attractions. Despite having "water park" in its name, this is not a commercial park. It is operated by a Mississippi water authority governmental agency. Beautiful tall pines fill the campground and surround a nice, clean lake. We visited in the off-season, but certainly this is a destination for water recreation in the warm months. The park is conveniently located about 10 minutes from Laurel. Sites are spacious, shady, and convenient to the water. Facilities and grounds were very well kept. We had full LTE cell service (AT&T). This is a great spot for a sleep-and-go or as a longer getaway. We would definitely stay here again. We stayed one night in site #39, a pull thru site with full hook ups. We camped at Big Creek 10 Water Park in a Travel Trailer. Visit the Laurel Mercantile Company and the Scotsman General Store in Laurel's quaint downtown area. Be sure to eat lunch at Pearl's Diner downtown---it is fantastic! We stayed just one night in a 40 foot fifth wheel. We don't typically rate overnight stops but this one is special. This is one of eight water parks that are part of the Pat Harrison Waterway System. The sites were full hookup, 50 amp, large level sites, in a great location with a great view. We were here in the fall and the weather was cold with a significant freeze coming. The park was nearly deserted but it looks like the kind of place that would be hopping during the summer time. The park is very well maintained and simply beautiful. I would definitely stay here longer if plans allowed. Sorry but too cold and rainy for photos. You might prefer a back-in site as they too had plenty of room. The pull thru sites in this loop had patios that faced the road which I am not at all fond of. We camped at Big Creek 10 Water Park in a Fifth Wheel. Roads paved a bit tight in a few places. Sites: paved with 20/30/50 amp power, water and sewer. Mostly level but maybe at extremes of leveling system. Note on sewer - pay attention to location of sewer when positioning your rig. I had to use 2 hoses and back up 15' to reach the connection. Bathrooms and showers were clean. Showers had good pressure and plenty of hot water. Verizon phone and Mifi worked fine. No CG wifi. Host helpful and friendly. Reservations are made by phone only. It has a nice little lake for paddling around in and allows water skiing and jet skies. Nice quiet park with good facilities. We'd stay here again. We camped at Big Creek 10 Water Park in a Motorhome. It's about 20 minutes outside of Laurel for shopping. Stayed here for a weekend to visit family. Park staff were very accommodating and helpful. The fire rings had some trash in them but otherwise the park was very clean and well kept. We camped at Big Creek 10 Water Park in a Fifth Wheel. Nearby Laurel 10 minutes away has groceries/gas/auto parts stores. We drove down to Hattiesburg for a day trip and ate at Georgia Blue; it was wonderful! Did not use the showers or restroom but they were clean and well kept. Lots of trees and sites did not require a lot of leveling. Very quiet only a few campers in our loop. Would definitely stay here again. 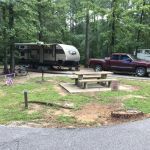 We stayed two nights while visiting Laurel, MS. We camped at Big Creek 10 Water Park in a Travel Trailer. The city of Laurel is just 15 miles away. Great shopping and restaurants in this town of 20,000. Very nice art museum and historic district. Small lake at the campground that is supposed to be decent fishing but I did not have a chance to fish. Stopped here for a couple of days on our way to Fl. It's worth the stop. Sites are paved and close and somewhat level. Elec, water, sewer are avaialable. The sewer hook-up was not close enough for one hose. I had to use my two hoses to reach. Most sites have nice shade. Fire pit and park style grills available. Roads are paved and easy for kids to ride their bikes. The park was busy over the weekend but mostly families with small children. The security/ranger makes many rounds and ensures all campers are well-behaved, which we like. We camped at Big Creek 10 Water Park in a Travel Trailer. This time of the year, the campground was quiet and very restful. The campground is easy on and off of US 84 and had a large enough sign to tell me to turn right when I GPS told me to turn left. I couple of tight turns and a few trees should be removed, but we were able to make the turns in our 40' with a tow. Will stay again. We camped at Big Creek 10 Water Park in a Motorhome. You are away from any stores, so make sure you have adequate supplies. Shady, by the lake and quiet if you stay in the first loop 1-27 away from the boaters and jet skiers. Good showers, but the toilets have no seats - part of the design of the toilet-weird. We camped at Big Creek 10 Water Park in a Motorhome. This park is one of a number in the Pat Harrison Water Park system. The park offers full services and has large sites with either paved or concrete pads as well as fire pits and barbecue stands. They offer PA reductions on certain days as well as senior discounts. A nice quite getaway. We would stay again if in the area. We camped at Big Creek 10 Water Park in a Travel Trailer. Paid Passport America rate of $8.25 for first 3 nights and $15 (senior) for 4th night. Park has two RV areas and is part of the Pat Harrison Water District which runs about 9 "water parks". The sites with the higher numbers has been recently updated, all new pavement, sites and roads. 50 amp service with sewer. Nice quiet park very much like a COE park, big roomy sites with plenty of space between them. The only one downfall we had was a bunch of small ants that must have gotten disturbed. They were all over the RV and we did not have ant spray with us. Other than that we had a good time. We camped at Big Creek 10 Water Park in a Motorhome. Are you affiliated with Big Creek 10 Water Park ?